Chanel finally came out with a super lightweight water-based foundation last spring and I think it is one of their best new products. The ultra-fine and oil-free fluid feels like a second skin and blends easily. It is available in 10 shades and contains SPF 15. Laura Mercier is a cult favorite and I must admit I am one of their biggest fans when it comes to natural-looking foundation. Even though the name says tinted moisturizer, this superb formula has coverage and evens out the skin perfectly. I like both formulas depending on the season (oil-free and regular). This foundation also has SPF 20. The Triple Seaweed Foundation is an oil-free gel formula that evens out skin imperfections and offers an instant healthy glow. I like that it is super lightweight and 70% water based so you can layer if for more coverage as needed. Also, visibly reduces the appearance of wrinkles and fine lines–just love it! For a lightweight and soft foundation, L’Oreal’s Visible Lift is a great product, especially for the price. It protects your skin with SPF 17 and evens out skin tone. Plus, it comes with a brush applicator and is easy to apply! Revlon PhotoReady foundation gives you picture-perfect skin without caking and feels light on the skin. It can be found at your local drugstore but feels like expensive department store make-up. 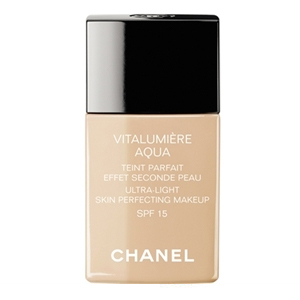 Chanel Vitalumiere Aqua is my ultimate fav…go on so silky and sheer. I love Avon’s foundations. They are light, gives great coverage and oil free. Funny that the Chanel Foundation was the first one on your top five list as I also have very sensitive skin and think that is the culprit of the terrible rash that I now have on my face. They coincided around the same time so I am inclined to think so. I stopped using it but also started antibiotics and my skin seems to be clearing up now. I think I’ll go back to the Guerlain foundation I was using. I can’t believe that one didn’t make your list. Also Nars, two of the best I have used. Lancome has a new foundation that blends seamlessly into the skin tone. It give the appearance of a lit from within glow. is sheer but has enough coverage to even out the tone of the skin. I’m loving “TooFaced” oil free foundation – great coverage – good colors and lasts all day.